• Model tab / Library tab: The Model tab shows the model hierarchy, i.e. the composition of all the elements of the model. The Library tab shows the 20-sim library. 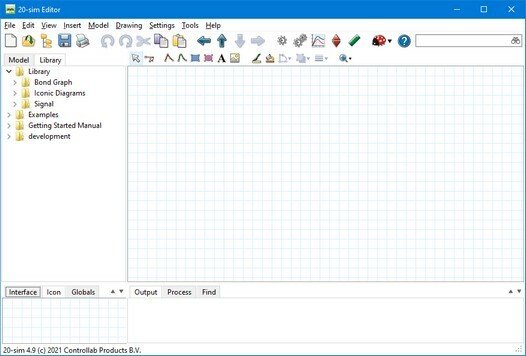 • Graphical Editor / Equation Editor: At the lowest level of the hierarchy this editor will show the model equations. In the higher levels this editor will show the graphical parts of your model. • Output tab / Process tab / Find tab: The Output tab shows the files that are opened and stored. The Process tab shows the compiler messages. The Find tab shows the search results. • Interface tab / Icon tab / Globals tab: The Interface tab shows the interface (inputs, outputs, ports) of a selected model. Double clicking it will open the Interface Editor. The Icon tab shows the icon of a selected model. Double clicking it will open the Icon Editor. The Globals tab will show the global parameters and variables of your model. Double clicking it will open the Global Relations Editor. The best way to find your way around the Editor is to read the Getting Started manual. It contains a number of topics that will explain the basics of entering equation models, graphical models and run a simulation.